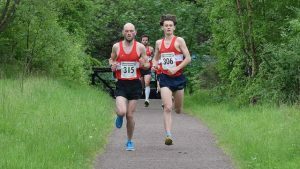 Cambuslang Harriers Down by the River 10K and 3K Road Race Races took place on Sunday 20th May 11 weeks after the event had to be postponed due to heavy snow. The start and finish to both races was changed due to house building taking place in that area. Apart from the initial and final 200 metres both races are run along the Clyde Walkway. The club is extremely grateful to our 10K sponsors achilles heel, our kit partner, and to Macdet Hygiene Services, a family company started up by former member Jim Fitzpatrick now sadly deceased, and to our 3K sponsor Barnie Gough Fencing. In the officially measured 10K race the hosts mainly dominated the male prizes while the ladies prizes were evenly spread out. 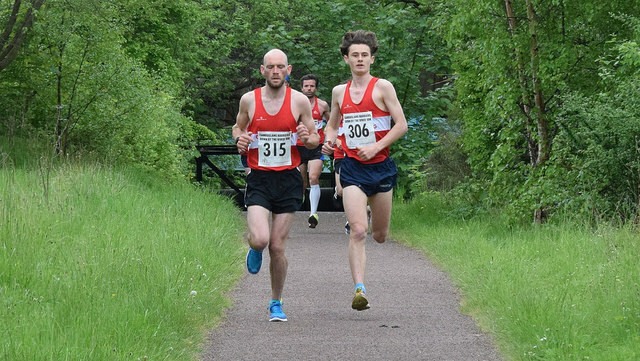 Cambuslang took first and second places thanks to the rapidly improving Fraser Stewart in a time of 32.20 and to club captain Iain Reid in his first race since the London Marathon who finished 32 seconds adrift. In an exciting sprint to the line Paul Sorrie of Shettleston just got the better of Colin Reilly. Colin however had the consolation of being the 3rd counter for the victorious Cambuslang team. Cambuslang also took the M40, M50 and M60 prizes thanks to Stevie Wylie, Alick Walkinshaw and Brian Hughes while Kilbarchan’s Robbie Ferguson captured the U20 award. 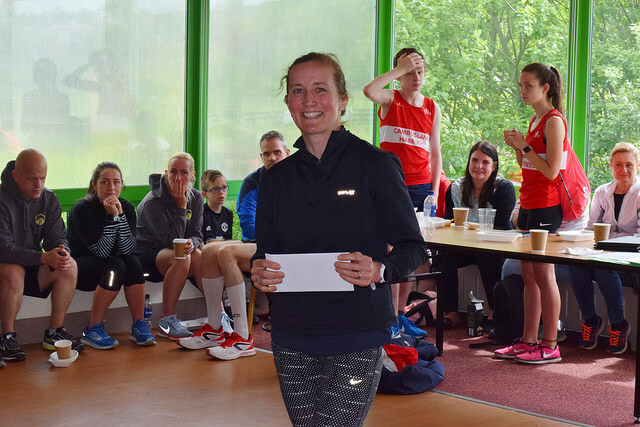 In the ladies event Laura Wallce of Ayr Seaforth was first home in a time of 38.49 followed by Ruth Fraser-Moodie of Springburn and Romy Beard of Bellahouston Road Runners who led her club to team victory. 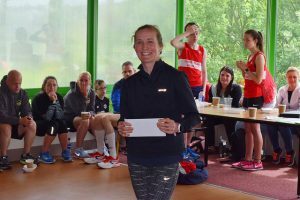 Emer Campbell also of Bellahouston Road Runners was first F40 while Joyce Allardice of Motherwell and Erica Christie unattached lifted the respective F50 and F60 category awards. Morgan Beaton secured the U20 ladies prize. Both male and female race winners were presented with the Jimmy Sands Memorial Shields in honour of former member Jimmy who won a Paralympic gold medal in 1988. Cambuslang had a good representation in this race with Ritchie Carr setting a pb in 6th place being followed home in order by Jamie Reid, John Paul Murphy, Mick O’Hagan, Frank Hurley who recorded the fastest M65 10K time so far this year in the UK, Daniel O’Connell, William Fairley, Gary Miller, Eddie Carr, John Kelly, Lesley McArdle, Sandy Eaglesham and Julie Dell. 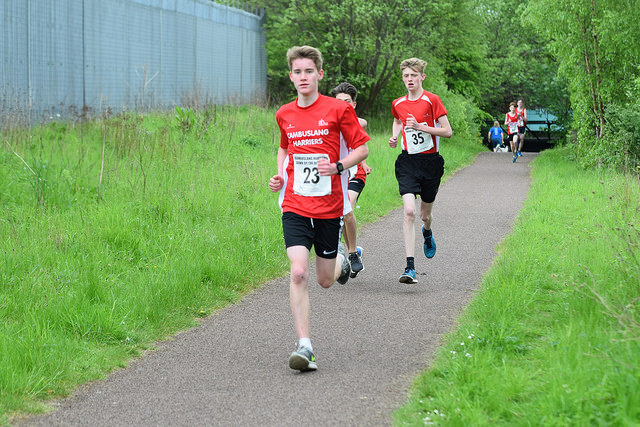 The 3K race was a predominantly young athletes’ event with Cambuslang securing the first 3 male and female finishers. Michael Black crossed the line first in a time of 10.06 closely followed by Robbie Woods and Aaron Grew with only 6 seconds separating the U17 trio. Susie McLaughlin U17 was first female home in a time of 11.21 with U15 Millie Nicholl next in 11.38 followed by U15 Shona Carey. U15 Cambuslang runners Zac Povey and Lewis Roddis took 4th and 5th spots followed by team mates Abbie McCue, Peggy Nan Rodger, M60 Alan Wyllie who recorded a pb, Holly Brock, Eilidh Kennedy, Lucy McGrandle, Korin Weir-Stewart, Jacob Reilly, M65 Willie Mitchell, Olivia McNicol, Christopher Black, Katherine McNicol and Cara McDowall. Special thanks is due to our members, parents and supporters who assisted in the pre race organisation and on the day itself and to Colin Stephen who vividly captured on camera both races. Also at the weekend club member Moira Stewart set a 10K track pb of 33.41.17 representing the Czech Republic in the European Cup Championships. Moira, the Czech 10K tack champion, is the daughter of Eddie Stewart the current Scottish M60 Cross Country Champion as well as the M60 Czech 10K Road Champion. Her mother Mia has also won Czech National Distance Titles. Both Eddie and Mia first met at a cross country race in Italy in 1992 when they were representing their countries. One year later Eddie moved to Prague where he and Mia married and are still resident there. Since then Eddie has won the Scottish Masters Cross Country Championships in the M40, M45, M50, M55 and M60 age categories. Their son Gerron is also a sub 2 minutes U20 runner. 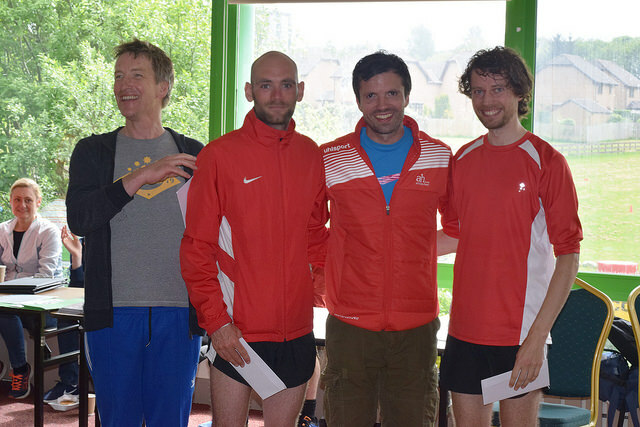 Justin Carter was also active at the weekend representing the West of Scotland in the UK Inter Counties Hill Running Championships in which he finished 2nd M45 and the 3rd West counter. 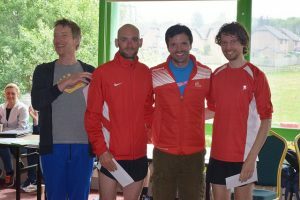 There were also 5K parkrun victories for Stan Mackenzie, Ian Littler and Michael Healy while Des Dickson and Michael Black set personal best times.